In 1984 the remains of Estherline Robinson were discovered by a film crew scouting location for a horror film in East Cleveland—she died in 1979. Her body was perceived as a white female body and caused a stir due to the defunct funeral home’s black ownership and clientele. This work is an examination of inter-generational trauma and the capacity for reconciliation after years of structural and interpersonal violence—long after lengthy silences have obscured the story itself and the external environment continues to erase one’s existence (mentally, emotionally, physically and spiritually); the impact of removal. The remains of Estherline Robinson were interned in Westwood Cemetery in June of 2018 by her great-grandchild, M. Carmen Lane. On August 21, 1955 Emmett Louis Till arrived from Chicago, Illinois to Money, Mississippi. Seven days later his body was dumped into the Tallahatchie River after being lynched by white men who accused him of “wolf-whistling” at a white woman. He was fourteen years old at the moment of death—weighed down by a fan. Three days after the dumping, his naked body was removed from the river after two boys discovered it while fishing. The white woman had lied. This work is an examination of the agency of Spirit within the lived experience of black bodies under siege navigating both the natural and constructed world—the medicine to soothe the dissonance; necessity of contact with the ancestors in the face of a constant molesting of the meaning of the black experience—here/now, then. A Color Removed was conceived by Michael Rakowitz, as a response to the shooting of Tamir Rice by Cleveland police, and was debuted as a call to action during his 2015 Beamer-Schneider Lecture at Case Western Reserve University. In response to community feedback and the involvement of the Rice family, the project evolved to include a group exhibition of newly commissioned works by Cleveland-based artists who have long explored the conceptual underpinnings of A Color Removed in their work. 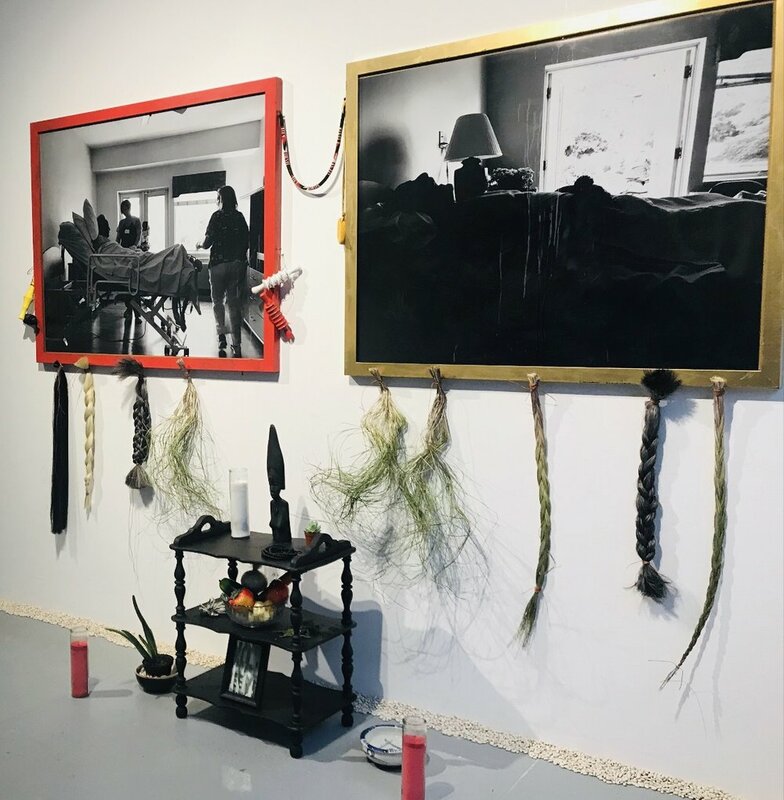 This site specific intervention of the sacred examines the in-between; the before and after death through the experience of the artist’s grandmother, Vivian Murphy. In her own words knowing “you’re about to pass away” is a new experience. Here, the artist explores the intersections of race, class, gender and the possible meanings associated with the taking of a last breath in a black or brown body aged almost a century in a constructed environment that renders harm through invisibility. Closing out the life you have lived in your raced and gendered body is a ceremony of becoming—a return to human being.